Mayonnaise Cake, Extra Moist and Flavorful, Perfect for a Picnic from a Mix! | Cook, Party, Enjoy! Mayonnaise Cake, Extra Moist and Flavorful, Perfect for a Picnic from a Mix! Surprise your family with this quick and easy, Moist and Delicious Cake with a secret ingredient mayonnaise. Mayonnaise you say, ugh. Don’t judge my friend til you try this. It is yummy! My daughter made an unusual request. She asked me to make a cake like the ones Kentucky Fried Chicken sells, the chocolate one with chocolate chips and it is like a real small Bundt, very moist and has a icing drizzle. She said she had a small piece at a friends house and is just craving a slice. I asked her why she didn’t just buy one and she said she thought I would make a better one. I think I am being played but I love the fact she wants her mom to make one for her. So of course I am digging through my recipes, I knew I had a mayonnaise cake recipe that makes a very moist and delicious Bundt cake. I found my recipe written on a piece of graph paper in the bottom of one of my recipe boxes. This is a really old recipe. I remember my grandmother giving this recipe to me when I was in probably 8th grade. I remember I was taking Home Ec which i barely passed with a D. Another story. She had told me this cake came about when it was hard to get fresh eggs and oil. Mayonnaise is of course made from eggs, oil and usually lemon juice or vinegar so it is perfect for making a cake. I do not make the cake from scratch but from cake mix. It works with any flavor cake mix just like the cookies and allows you to make additions to really make your cake special. Super Moist Cake from a cake mix, so quick and easy. Now for the cake I am making I am using chocolate cake mix and 1/2 cup mini semisweet chocolate chips. You can use this recipe to turn any cake mix into a rich and moist Bundt cake. Add nuts, chocolate chips, raisins, you love it, add it. You can also make it in a 9×13 pan or 2 9″ cake rounds and frost. In a large Mixer bowl combine the eggs and mayonnaise, add water and continue to mix until all the ingredients are mixed together and it is a little fluffy. Slowly add cake mix and mix on low for about 2 to 3 minutes. 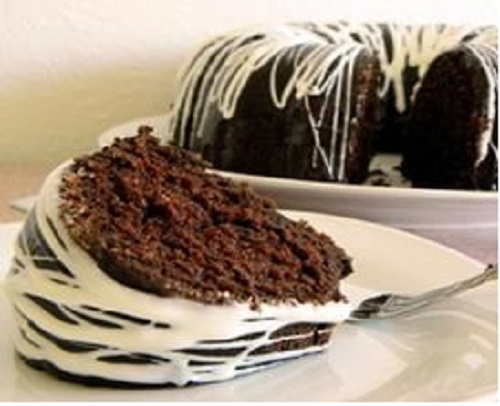 Pour batter into a greased Bundt pan or Tube Pan or 2 9″ round cake pans. Put in oven at 350 degrees F and bake for 30 minutes. Test doneness using a clean knife or skewer. It should come out clean. Cool cake for 5 minutes in pan and then invert onto cooling rack to finish cooling. Combine to the consistency that can be drizzled onto the cooled cake off a spoon. The cake turned out better than I even expected. Moist, real chocolaty, and the chips added that extra something. I will not put this recipe back in the bottom of my recipe box. ← You don’t look 90 !